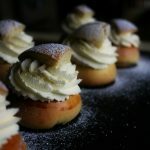 ‘Tis the season, or so I am told by my Swedish friends, to get your hands on these wonderfully aromatic and creamy buns – Semla. However, since I don’t live in Sweden or any of the other Scandinavian countries I will have to make mine from scratch. Semla is made with an enriched bread dough scented with cardamom and vanilla. 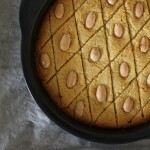 Then it is traditionally filled with almond paste and topped with a generous amount of freshly whipped cream. Then dusted with icing sugar, of course. You can eat it as is or you can take it one step further and eat it from a bowl with warm milk poured all over. Omg, if that isn’t the definition of comfort food, I don’t know what is! Easter is upon us and apart from stripping the shelves bare of chocolate eggs and Easter bunnies we also cram the bags full of delectable cinnamon hot cross buns. Then the season ends and you find you are left with buns galore … now what to do with them? 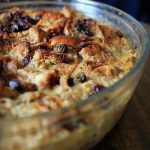 Don’t throw them out, make delicious bread pudding instead! A beautiful dessert that is simple to make if you have a couple of the right tools on hand. If you don’t want to make this individually then simply make it all in one big springform cake tin. 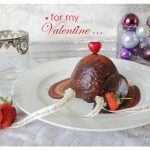 Treat that special someone in your life with this decadent dessert come Valentine’s day. 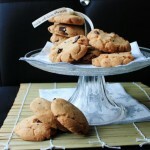 If you don’t feel like cooking up a gourmet three-course meal for Valentine’s Day, or if you’re not with anyone special this year and choose to fuss over your family and friends instead, then how about making a batch of simple, yet delicious chocolate chunk cookies. No one will be able to resist them and you will be the star in everyone’s eyes. Spread the love! Today’s recipe is a themed cupcake, using a Guinness cupcake recipe, homemade vanilla buttercream and some handcrafted sugar decorations. 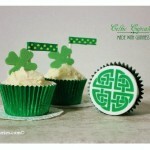 These cupcakes would be very much appreciated at any St Paddy’s Day party. 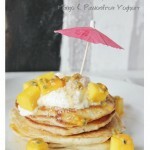 I’m just about done with the winter chill, so I thought I’d liven things up a bit in the kitchen with these tropic-inspired pancakes. Hopefully when I bite into them I’ll smell the sea breeze; feel the sand between my toes and hear the crashing of waves. Happy Shrove everybody! I have been playing round with this idea for the past six months now and it has finally come into fruition ~ Red Velvet no-bake cheesecake! 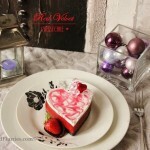 Perfect to share on Valentine’s Day with your significant other! Bright red with a full chocolatey flavour, this will definitely be hailed as dessert nirvana. Today we are upping the ante and pulling out all the stops for our significant other and loved ones with this Valentine’s day special. 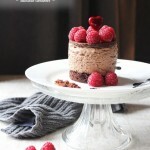 Creamy decadent raspberry mousse + vanilla sponge + a rich chocolate coating. Who wouldn’t want to receive this at the end of dinner? 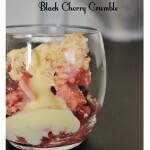 Stewed fruit topped with buttery crumble makes for a very satisfying end to a meal. I went for a wintery flavour by making this crumble with a combination of sweet juicey dessert pears, tart apples and dark cherries. Served warm along with vanilla custard, this dessert is perfect on a chilly night.